Inspired by the hinge in someandy's Embossing Stamp, today we make a hinged butterfly. The image came from a screenshot of butterfly on wugange.com and was converted to .svg format by online-convert.com and then imported into Tinkercad. Most of the fiddling was testing and retesting the hinge and figuring out how to attach it to the butterfly. Settings: Makerware "standard" without supports, which took about 35 minutes to print. 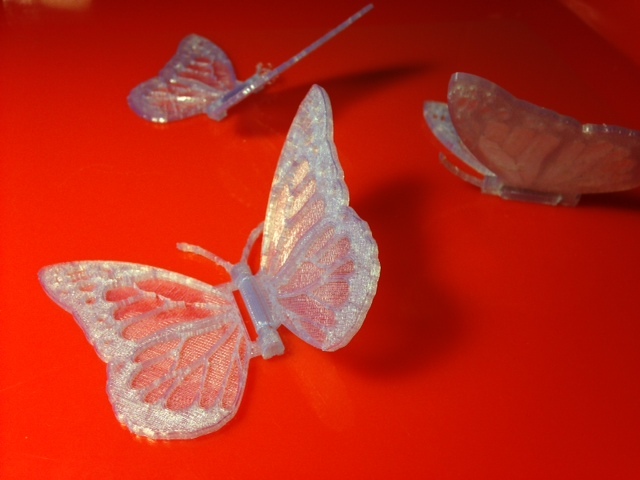 This turned out to be a Goldilocks situation - on "low" the model was too coarse and striped and the nozzle moved too fast to lay down the start of the model correctly, and on "high" some of the butterfly details came out too small and fragile. Technical notes: If the hinge doesn't work correctly for you, try printing with supports - they will support the post that goes through the middle of the hinge. The supports should then break the first time you bend the model (this worked for me on the "low" setting). Stuff you might want to change: The antennae are very fragile, so they could maybe be larger. The thin translucent part of the model could be thinner; I made it to be one layer on "low" but on "high" and "standard" it is two layers deep. UPDATE: This design was "featured" on Thingiverse today!